a tension free putting arm-hang. Don't contort your body at address. Find a tension free position as best you can. To putt consistently you must establish your putting arm-hang at address. You do this to find a good ball position, one that eliminates any tightness in your body that can be harmful to a smooth and repeatable putting stroke. In a relaxed setup when you tip forward from the hip your upper arms hang vertically under gravity without any tension. This places your elbows directly under your shoulder sockets. You could call this a neutral position. You will notice, however, that your forearms are angled forward of your shoulder line because of the muscular structure at your elbow joint. In other words they don't hang vertically below your elbows. In the picture (see above) the angle off vertical is 17 degrees. This angle will, of course, differ from person to person depending on their build. The above alignment of your arms and hands runs contrary to the common advice in golf instruction that you should position your hands under your shoulders. To achieve this arrangement requires that you angle your elbows in towards your body. 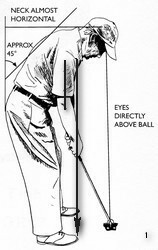 This is a held position that involves a mild degree of tension to sustain it throughout your stroke. In a tension free setup your shoulders and elbows would align with the balls of your feet with your hands further just forward of your toes. The ball will then be positioned about 9 to 10 inches forward of your toe line. If you stand too far from the ball, your hands hanging freely will come back towards you. Conversely if you stand too close to the ball your hands will move away at the start of your backstroke. To find a tension free position, just hang your arms and hover your putter with a loose grip. It is possible to flatten out the angle at your elbows and align your upper arms and forearms in a poker-like fashion so that your hands are under your shoulder sockets. However, this is unnatural and again is a position under tension. This is what the knowledgeable Geoff Mangum of the Puttingzone has to say. 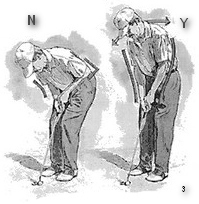 "The rule that the hands have to be below the shoulder sockets for the stroke to stay straight is not really correct. So long as the golfer keeps the muscle tone to keep the Putting Triangle in tact, the hands won't tend to alter in relation to the thighs or feet at all during the stroke." Angling your elbows back to position your hands under your shoulder sockets makes it slightly harder to manage your putting stroke. This is because controlling an abnormal arm length can lead to inconsistency. Needless to say there are many examples of good tour players who putt either with their hands outside, under, or inside of their shoulder line. The advice in this ezine is directed to the recreational golfer who cannot devote time to perfecting an individual style. Simply put, it is to avoid crouching, but rather stand tall to allow your arms to hang loosely. This will position your hands naturally in a tension-free position as you tilt forward.